What a crazy week! I have so much to do and things just keep getting added to my TO DO list and I don’t think I’ll be able to do it all in time. This called for a very quick and easy lunch that needed to be made in half an hour. 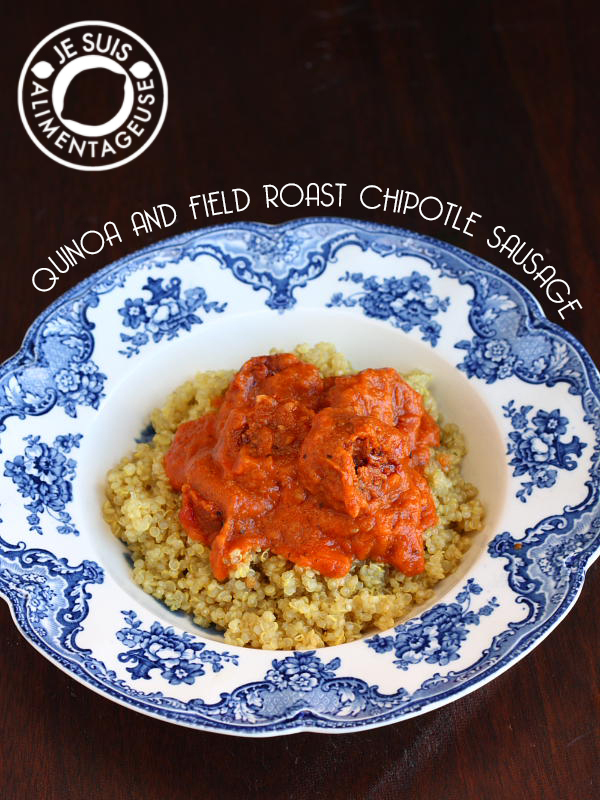 This quinoa with Field Roast Mexican Chipotle Sausage is super easy, quick, and superbly filling. Quinoa is so full of protein and I love using it like a grain. The sauce I used is my simple tomato sauceÂ that I posted on Tuesday, and it’s a perfect base for absorbing some of the spice from the sausage and adding some extra flavour to my quinoa. Quinoa is a faux-grain that I love to use like rice. It’s so good and versatile, but because its popularity, the price of quinoa has soared in countries like Bolivia, where it is most widely grown. As a result, local farmers and communities can no longer afford to eat quinoa, and the rate of malnutrition in areas that grow quinoa has begun to rise, despite the farming of quinoa there. While higher exports are great for Bolivia, capitalism and health fads bring up the value of quinoa and make it so that farmers no longer Â sell their own crops locally at an affordable price. Because of this, I have stopped eating quinoa as frequently as I used to, and I try to buy organic and fair trade quinoa (although it’s not always available). To make the quinoa, combine the quinoa and vegetable broth in a pot and cover. Cook over medium low heat for about 20 minutes. Do not peek and lift the lid! It lets the steam out, and you need that steam to cook it. After the 20 minute mark, take a look, and if all the liquid is gone, turn off the element and remove from heat. Fluff with a fork and set aside. The sausage is already "cooked", so now you're reheating it in the tomato sauce. Over medium low heat, heat up the sausage in the tomato sauce, stirring frequently so that the tomato sauce doesn't burn. Turn over the sausage regularly for even cooking. 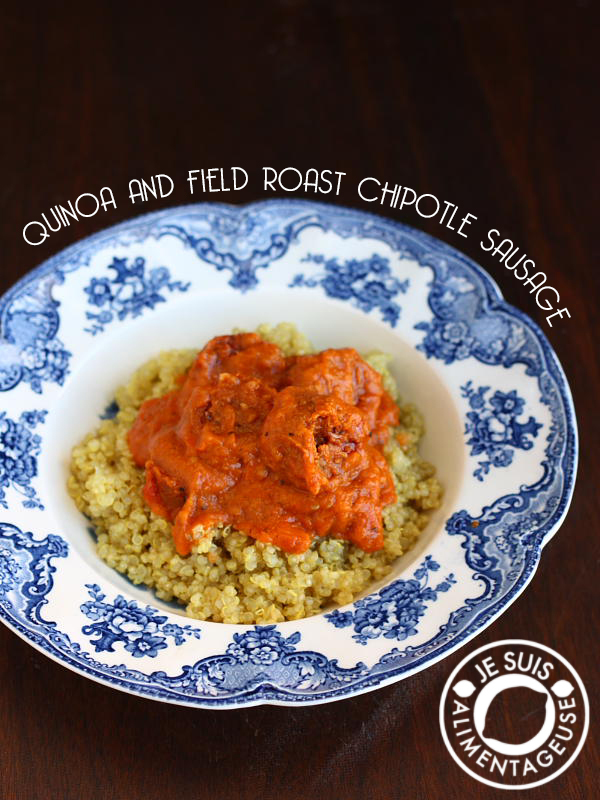 Once adequately cooked, cut the sausage into coins and serve over a bed of quinoa.